Add Google plus Pop up widget For Blogger. Helps To increase your Followers and increase traffic. It is like Facebook Pop Up Like Page. Blogger widget for pop up google plus is a tremendous widget to increase your G+ followers and building relationships. Even Google has mentioned the importance of social bookmarking websites. You have seen this widget like Facebook Pop Up Like page when you just visit any website. Such blogging tips and blogger widget are also important when you do not get organic search results but if you have a bigger list of followers than you do not have to worry about traffic your Google plus followers will give you traffic. Image Accordion Widget For Blogger For Custom Recent Posts. Pure CSS Based Widget For Blogger. * Visit http://www.exeideas.com/ for full source code. Change the highlighted text with your google plus id and save the widget. 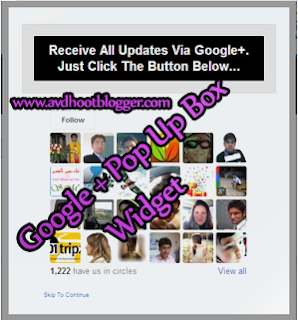 I hope you liked the google plus pop up box widget for blogger. Feel free to comment and share.